Bouffe is doing well, headtilt or no headtilt. If you have been Googling rabbit + headtilt because you are going through the same with your rabbit, maybe what we have learned is of help. First off, let me emphasise that I am not a vet. I want to share my learning with you, but you should know that reading about my experiences can never replace professional advice from a qualified veterinarian. Now that that is out of the way: if you’re concerned your rabbit has a head tilt, you must take it to the vet immediately. Really, I mean it. Don’t think you might give it a couple of hours to see how bunny does tonight or tomorrow morning. It won’t sort itself out; it will only be worse. Headtilts do come in grades of severity. The sooner you know what is causing it, the sooner rabbit gets treated, and progress can be slowed or halted. Headtilts are also very distressing for rabbits, so please, look after yours and read the rest of this post when you’re back from the vet’s. There can be different causes for headtilt, another reason to take it to the vet and not self-diagnose on the internet. e.Cuniculi is a nasty parasite which wreaks havoc in rabbit brains once it gets there, and this damage is causing the headtilt. Most rabbits carry the parasite but never suffer any ill effects. It can attack the central nervous system in various places, if it does so in the brain, headtilts are the result. Bink suffered from this ‘form’ of headtilt. Bink’s balance was severely affected by e.Cuniculi, even after several weeks. e.Cuniculi is difficult to treat, but at least there is a chance something can be done to improve your rabbit’s health. Common treatments are based on fenbendazole and are sold under the names Lapizole and Panacur in the UK. Bouffe is thought to suffer from a Pasteurella infection in the middle ear, another known cause of headtilt. His is being treated with penicillin – Norocillin, to be precise – and this has helped him a great deal. A great place to learn more about causes of headtilt is the House Rabbit Society. This story is about Bouffe, whose headtilt was not caused by e.Cuniculi. Headtilt can creep up on a bun – looking at some pictures of Bouffe taken shortly before it really struck him, he already had a very slight tilt. There were no other symptoms to suggest anything was wrong, apart from having two lots of surgery on his ear within just a few weeks. The below picture shows Bouffe shortly before his headtilt took hold, and you can see the difference between left and right cheeks: this is thought to be caused by paralysis of the facial nerve linked to his middle ear infection and/or the abscess on his ear canal which started it all. A slight tilt was visible before the episode. Note his left cheek (right for the viewer) pulling up, too. Then, one night, Bouffe very suddenly began to fall on his side, thrash non-stop for hours on end, kicking, knocking himself on his cage and bowl, and violently flipping for no apparent reason when we did manage to get him back on all fours. Very upsetting to watch, because he was very distressed throughout. Holding him close and stroking him was the only way to calm him down. We sat with him on the floor for hours throughout the night. He was the first in the queue at the vet’s the next morning. He was diagnosed and prescribed a suite of medication which included pain relief. 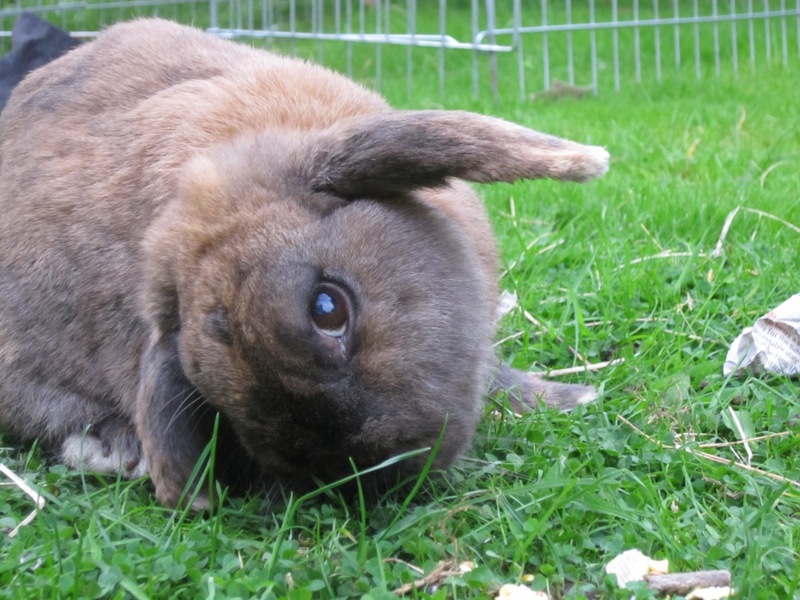 Apart from requiring medical treatment, a headtilt rabbit has special needs. Meeting these to the best of your ability will make a huge difference to their chances to recover at least partially. 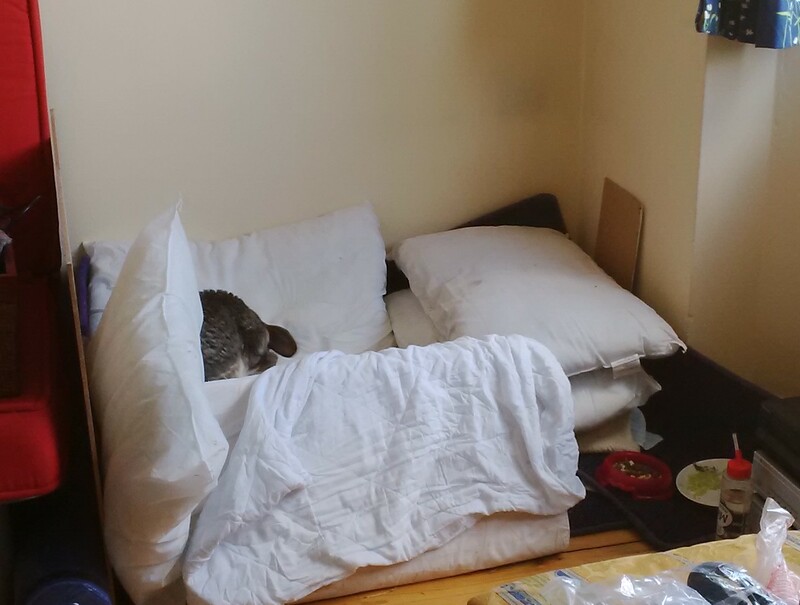 The first thing we did after seeing the vet was build him a small, comfortable bed surrounded by cushions. We put it in a dark-ish corner in our home office so we could watch over him and help him. Bouffe was falling over a lot and he was soiling his bed, so we cleaned him at least once a day, usually more often. Rabbits hate living in dirty quarters. We learned how to make the bed comfortable and safe for him to tumble around in from the incredible Special Bunny website. Rabbits need to eat virtually non-stop. Their digestive system is like a conveyor belt: it needs constant filling up and emptying. If their digestive tract stops moving, huge problems invariably follow. More on gut stasis, as this is called, can be found on the House Rabbit Society website. In Bouffe’s case, eating has never been a problem. His appetite did not abandon him now, either. We did notice one thing, which is very likely connected to his ear infection: he was unable to chew off chunks of vegetable. We grated his vegetables which had the added benefit that we could mix in a powdered dose of fenbendazole, which he was on for good measure, even though we are quite sure the headtilt was not caused by e.Cuniculi in his case. We know Bouffe is ‘EC positive’, and we didn’t want the parasite to get a chance to get a hold too while he was weakened by an ear infection. Ask your vet about preventative treatment, if you are concerned. Providing drinking water posed a bit of a problem. Bouffe couldn’t use a water bottle, and putting a bowl in his bed was risky as well as messy. We partially solved the problem by offering him a lot of ‘wet’ greens like celery. We also offered him his water bottle several times a day to see if he fancied a drink. Fortunately, after about two weeks Bouffe’s recovery was such that he was able to have a water bowl to safely drink from. We kept a close eye on his hydration levels and replaced dried out celery several times a day so tempt him to take more. He needed a lot of help with eating. Bouffe responded well to Norocillin, a penicillin, which we injected every other day in the early days and weeks. He seemed sensitive to light in this first period, so we kept him out of bright light but within earshot of us. We frequently went over to prop him up a bit, offer him some favourite morsel, or just cuddle him for a while. After the first few days, when we spent almost 24 hours a day with him – you can do this when you run a business from home! – he calmed down and the rolling and falling started to lessen. He seemed less stricken and gradually became more confident to try and sit up. After about two weeks we noticed he spent muchless time sleeping. He started to develop strategies to get up after rolling over, and as he gained strength, this became a bit of a ninja-flip he appeared to be a little bit proud of. He also learned how to prop himself up by parking his bottae in a corner, so he could groom himself and have his morning cecals. The first few days we would find them for him in his bed and offer them to him to eat. Fortunately for us, Bouffe has always been partial to food. Feeding him has always been a joy – everything is devoured with grunty pleasure. A side-effect of feeding is of course that bunny also needs to go. We had tried a litter tray, but he couldn’t get in it himself, and if we put him in ourselves, he would become very distressed and start thrashing about all over again. The way we made his bed ensured that Bouffe could just wee in it, and the fleece would wick it away, minimising scalds. All it took was to have a few clean sets to hand and within minutes he’d be comfortably installed in a clean bed. The only problem is that Bouffe turned out to be an exceedingly proper bunny: he held up his wee for two whole days at first, before he weed in his bed. After he gave in, he only went once a day, even when he probably knew he would be cleaned immediately. Our least graphic ‘wee picture’. He’s still hiding in embarassment, though. Bouffe started to make big jumps in his recovery after about a week. He was clearly not dizzy all the time anymore; he started to gain strength; he had learned to balance and get up better, and we like to think he felt confident to venture out. We moved him back into his own corner in the conservatory and gave him a bigger bed with more room to move about. We went back into the house together straight after I put the camera down and had a lovely cuddle. We also noticed that he started walking on hard flooring again, as he always has. However, because of his tilt, he cannot see particularly well, and he had more trouble balancing on slippery floors. In this clip you can see quite well how he likes to stick to the walls on his right, and that discovering something in his path that wasn’t there before (me in this case) confuses him. Bouffe is, in effect, a partially sighted rabbit. From falling about and being quite helpless at first, Bouffe moved to being much more mobile in just a few weeks. As I write this, we are more than five months on from that dreadful night, when we really thought we were saying goodbye to him. He still has Norocillin injections, but only when he needs them. Currently that is less than once every two weeks. He needs eye drops (Fucithalmic Vet) because his ‘bottom’ eye weeps a bit – it is closed but absolutely fine otherwise – and the eye on top is prone to conjunctivitis. I wash both eyes gently with lukewarm water on cotton wool, dry them, and put a drop in each eye every day. He sits still while I do this, and licks my hand afterwards. Then he demands a treat for being good. Because he has been fussed over and handled so much in the last six months, Bouffe has become an extremely easygoing rabbit, who loves being around people. He’s very affectionate, confidently goes about his business, plays with his toys, and tells you what he wants. Bouffe is living proof that life with a head tilt can be just as fabulous as before. Hey! how are you ? im gianfranco from months ago i just wanted to tell you that milo got better from his head tilt! he even walks everywhere now and he is very happy! i just wanted to thank you for the support you gave me months ago and i want to tell to everyone in the world who has a rabbit with head tilt that THEY CAN GET BETTER YOU JUST NEED TO BE PATIENT AND CARING AND YOUR RABBIT CAN GET MUCH MUCH BETTER. Thank you so much for sharing. My bunny Maddalynne is currently strongly with head tilt. The vet diagnosed her with vestibular disorder which I guess is his explanation of head tilt since he could not find any reason for e. colliculi or other infections. I’ve spent some much on her at the vets the past 1 1/2 years. When I had her fixed she started having symptoms, like you, I feared I was going to say goodbye. I am currently one week into treatment and hope it doesn’t take more than a few weeks to see some improvements. The setup I have in cause anyone reads this and is looking for ideas… I put her in was a small dog bed for padding and safety-pinned a puppy pee pad to absorb urine to help with the mess. thank you for taking the time to share your story you’ve given me hope through this tough time. Ah, Maddalynne is a cherished bunny! I am sure she knows how much and equally sure that rabbits have a much better chance of healing and adjusting when they know someone loves them. Sending you affectionate snorgles and hopefully we’ll find an update with some good news sometime soon! Hi, so a week ago my bunny Milo suffered from an onset of head tilt so we took him to the vet and now is in a treatment with antibiotics and panacur, it has been a week and poor Milo has still that uncomfortable neck position (that gets whorse when he is stressed) so far im triying the impossible to give him a good quality of life but it breaks my heart to see him like this, so how much time does it take for a rabbit to improve in this kind of situations? thanks and sorry about my bad english its not my primary language. How awful to hear about poor Milo. I am glad you are looking after him so well, he’s a lucky bunny! Your vet has put him on some good medication, which is great too. Do they know what causes Milo’s headtilt? This make a difference in how he recovers or adjusts to his situation. If Milo has an ear infection, which is really hard to tell, then the antibiotics should help him. It’s what caused Bouffe’s headtilt and it was stopped, but not cured by the antibiotics. I have heard of several rabbits that had a headtilt that was caused by an ear infection that lived very well once they got used to having a head at an angle. The tilt did not get any worse because of the antibiotics. How long it takes for Milo to improve depends on what causes the tilt (there are a few other causes too; the ones I mention often occur), and also how strong and healthy he is and how much help he gets. It sounds like you are doing all you can which is great. With Bouffe, he really improved after two weeks. By then he could eat by himself, use the litter tray, wander about. He also spent much less time sleeping. – Is he eating (enough)? Try his favourite things if you’re worried. – Is he happy to see you and get cuddles? – Is Milo producing good poo? – Is he sleeping less and moving a bit more? Get Milo to eat as much as possible. He may find it hard to help himself to food, so go see him as often as you can and offer him something he loves (try not to feed him on treats alone though… as tempting as it is) and let him eat until he stops. If he’s doing those things a little more each day, those are good signs. It will take a bit longer to know for sure whether Milo is making progress, so keep up the good work, keep asking your vet for advice, and please come and tell us how he is doing! ps: his poo is normal and we try to feed him a lot , we also have give him critical care. That’s really hard. It’s possible that he is so affected by the bacterial infection that other things like the pasteurella and EC get a chance to attack and make him worse. It’s often a reason why vets will treat them for several things at the same time, sounds like yours is taking that route as well. You know Milo best and what he normally does and likes. For a rabbit eating is the most important thing, because it keeps them going. When they lose interest in that, it’s a bad sign. It’s not sustainable to keep feeding critical care, but sometimes it’s the thing to help them through a bad episode so they can eat normally again (by the I mean they eat because they want to, even if you need to grate their food or do something else to make it easier to eat). It’ll help you feel better about decisions you make for him knowing you’ve really considered everything important. If it helps, with Bouffe the first 24-48 hours were absolutely awful because of his terrible distress, and the 7 or so days after were very unpleasant for him too, but he was a little calmer and he slept all day. He was unable to get up by himself for the first two weeks and we had to do everything for him. The real turning point came after about 14 days when he was stronger and his medication had kicked in at full strength (some of these meds need to be built up in the body over the course of several days). It’s clear that you love Milo very much and you’ll do what is best for him. Sometimes it’s to let them go… I hope the scale helps you with the decision. Thinking of you, and we’re hoping very much Milo ‘does a Bouffe’ and becomes a very special bun who continues to delight you for many more moons! hey how are you, i just wanted to thank you for the support you gave me the last time, milo is much better now, even the tilt is less visible now and he runs and eats like before. he’s taking all his medications and its doing fine but can i ask you something? you see tomorrow here every place is closed (because its a holiday of some sort) and i just realized that i finished the antibiotics, if i skip just one day you think it can be too bad? its been like 20 days since milo started to take them and i havent skipped a day but this time i didnt realized… what do you think? That’s wonderful news! There are happy binkies all around here in the Bunnington Post newsroom. How clever is Milo?? Please give him lots of snorgles from us all. If he does have a little relapse as a result of missing a single day’s dose, he is likely to recover quite quickly too. Of course have a chat with the vet too to see what they think. So glad to hear Milo is much happier and running around and eating things. He likes his life with you! Well done for helping him through such an awful time and giving him a chance. He’s a lucky bun, that’s for sure. Hi our beautiful Barney has now had a head tilt for 4 days. He has been given 28 days panacur to treat suspected e.coniculi. It’s a real shock as this happened Sunday and Friday he was his usual self, running about after me to the fridge to get vegetables and cereal from the cereal cupboard in the morning. He sleeps by me and wants human contact all the time. It’s like having a puppy. Now to find him not moving and staring into space with a head tilt is awful and such a shock. We have had him 3 years but we think he is 6. I am completely in love with him. I’m devastated but praying he will pick up. He is eating still and going to the toilet ok. He is also on meloxidyl and I have syringes for water or critical care. He looks so sad now. Today was the first time he ran out from under the table to go into the other room, I was so pleased. My question is.. is there anything I can do to support his neck as it looks so uncomfortable? Thank you. You’ve been a great help. Thank you for your comment, poor Barney, such bad luck for him! Yes indeed, the onset of a tilt can be quick and sudden. I’d suggest asking your vet to treat Barney for an ear infection as a precaution – see what they say about that. Some infections cannot be seen as they are in the middle ear you see. As far as I hear from people’s experiences (and my own) it won’t hurt bunny to take the two-pronged approach even if it doesn’t have one of the two causes. It is great that Barney is eating and doing his business in the litter tray, that’s the first hurdle for sick and/or disabled bunnies. 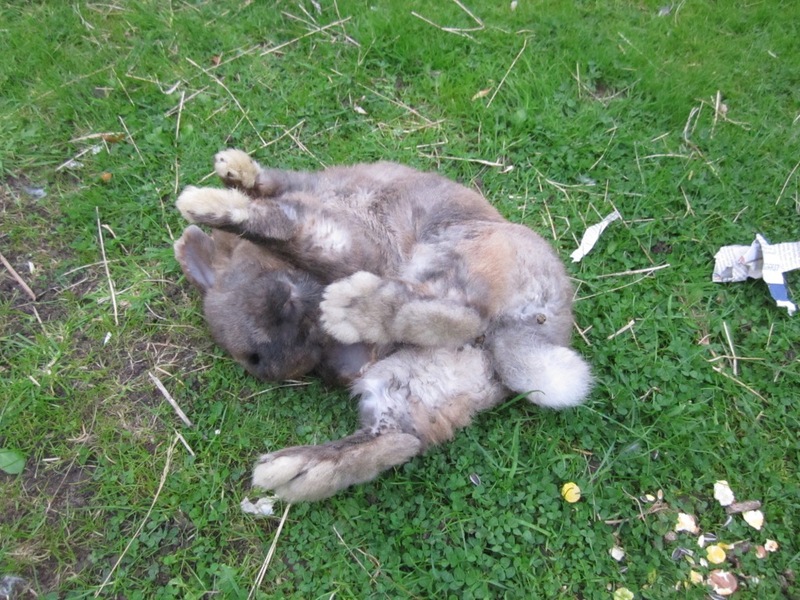 Rabbits are hugely adaptable, and Barney already shows he wants to keep doing his usual things! Take his lead, is what I’d say. The neck must be uncomfortable indeed, I can’t imagine myself that it wouldn’t be. Bouffe spends a LOT of time on his side resting. He also really likes it when we hold his head gently while cuddling him, and he’ll often come and lie between feet to rest his head on one which he seems to find comfortable. He also leans his head against chair legs (his wingback chair has bendy ones) and on his stuffed toys or even his treat box. Why not try out what Barney likes? He might enjoy lying in a cat bed with a rim, or he might like a stuffed toy. Sitting with him and cuddling him while gently cradling his head in one hand may also be appreciated. When the head grows heavier in your hand you know he’s enjoying the attention. I also sit with Bouffe and massage him gently from his shoulders to his hips with both hands mirroring my movements. Be careful to avoid the neck itself as Barney has major arteries there which you don’t want to go near. Sit in front of him with his head or his bum turned towards you. Use your fingertips and gently draw circles while you can just about feel his muscles and bones. Work from his shoulders along his spine (on the sides only-don’t massage the spine itself), he’ll tell you where things get ticklish! Some bunnies don’t like their hind legs and hips touched, in that case focus on his shoulders which gives the most relief anyway. It will help Barney relax and when you’ve found his favourite spots and the right pressure you can expect a blissed out Barney giving you a reproachful eye when you stop to attend to your own cramp! Good luck with the little fella, and please keep us in the loop on how he is doing! Just another question, Barney has improved loads! So I am very pleased. He had his ears checked & cleaned out & the vet was happy with them. He has stopped scratching his ears now & his head is now back to normal position. However today is the first day that he has started to drag his back leg again, which is a shame as he has not done this for about a month. Anyway, what I am asking is that is is a side effect of Panacur or something he is eating that his urine seems to be very strong? I have washed him twice since being treated for E.coniculi as he seemed to be more smelly in that area. Is this something anyone has heard before? Thank you..
That’s great news, clever Barney! Very glad to hear that, it’s wonderful to see that bunnies can recover from a tilt too. When we treated Bouffe for EC with Lapizole (same active ingredient, Fenbendazole) he developed similar problems – he lost all mobility in his hind quarters after about three days on the stuff. When we stopped the treatment, three days later he was back on his feet. Most peculiar and the vet could not explain it. We treated him with it a second time and exactly the same thing happened, so we now steer clear of the stuff, because he has enough problems with his tilt. The vet had never seen this but having witnesses it twice in Bouffe they agree the Lapizole was the cause. One possible and untested theory could be that the treatment causes die-off of the parasite which causes the symptoms. This is also called a Herxheimer reaction. We don’t know whether it is what happened with Bouffe but we stopped the treatment and this reversed the symptoms and apparently that is typical of such reactions (I need to add again I am not at all an expert in this!). You could ask your vet if they know of any other cases, we’d be interested to hear what they say. thanks very much again for instant replying! Unfortunatley Barney had the foot dragging symptoms about 3 months before anything else & it was only on 13th June that he was treated for E.coniculi due to being so poorly with a head tilt aswell. His leg dragging happens about once every 2 weeks or sometimes twice a week! We were treating him for a trapped nerve or muscle damage in case he jumped off the sofa too high etc. So he was on Meloxydil anyway for this. But yes I will see what hes like once his course of Panacur has ended. We are on day 16 I think at the moment. Any ideas about the strong urine smell? Thank you so much. It could be a urinary tract infection or sludge. Our Katrijn is prone to a build-up of calcium in her bladder and her urine is very dark and smelly when this happens, plus it’s painful for her and she strains when she pees. Rabbits are also known to sometimes sit in their litter trays or in puddles when they have a UTI and their hygiene is different. If Barney has sludge (the vet will tell you) you can make some small changes to his diet by reducing or cutting out vegetables that are high in calcium, and switching to a pellet for older rabbits. Katrijn does well with these minor tweaks and doesn’t need any other help. If he has a UTI he may need medication. 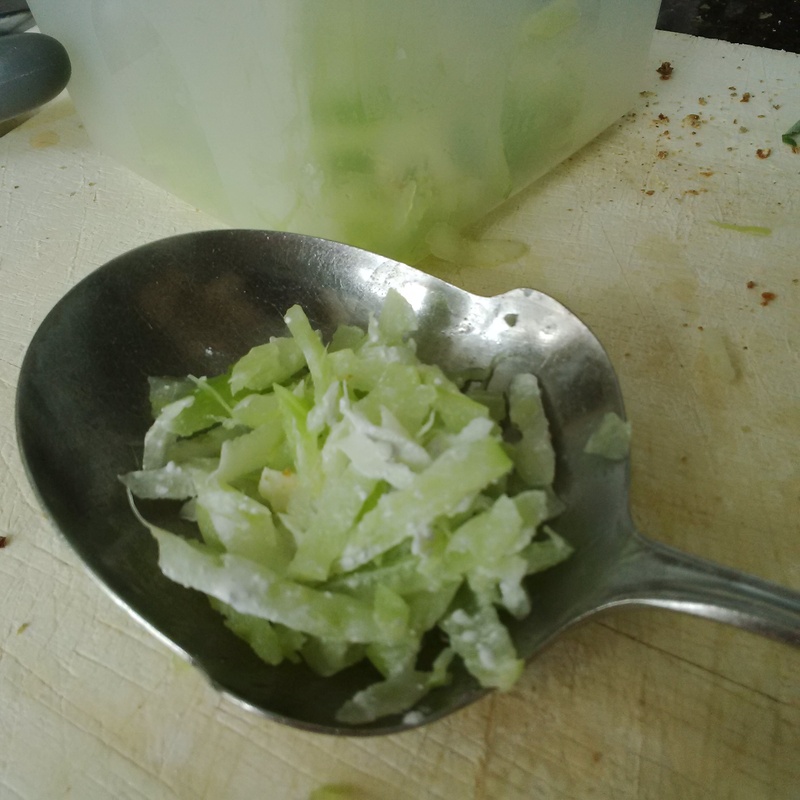 In both cases it’s good for him to get enough fluid so offer him ‘wet’ vegetables like celery and freshly washed greens with the water clinging to them, and encourage him to drink as much as possible. As always, if you’re worried about Barney, make sure the vet checks him over! It’s much better to be sent home with a ‘it’s nothing to worry about’ than to sit at home with wondering if he’s alright… that’s our philosophy anyway! Thanks very much, i do give him lots of fresh leafy greens and celery with the water on, so i am pleased i’m doing as you suggested. I think he may be out of sorts as to where to wee, as when he was so ill he was under 2 different beds and id put the puppy pads on the floor for him to wee on as he was going everywhere then, now we have the litter tray in the living room by where he lays and its got sawdust in not his usual wood pellets and with his bad leg he seems to roll in it as he gets his legs out from under him. ive ordered more wood pellets so they should be here any day. his wee isn’t dark just he seems much more smelly than his usual bunny odour which i never minded. I will monitor him, but he seems to be going as normal with his tail lifted up. Thanks again! It’s good to hear Barney is returning more and more to his usual self. I did read on the House Rabbit Society website that antibiotics can make urine darker – perhaps Barney being on meds and out of sorts makes his pee smellier than usual. Who knows, perhaps he’s just special like that! He’s a lucky bunny to be so well looked after and I am convinced he knows it too. Go Barney! What a lovely bun Ballo is! It takes time to adjust and every bunny is different. Ballo has the advantage of youth I’d say! He’s getting some great care from you and your vet so he has a lot of chances to learn to cope with and maybe even overcome EC. I haven’t heard about motion sickness medicine for rabbits, but that doesn’t mean a thing. What does your vet say about it? Be careful to use only meds that vets trust for rabbits, because some that are safe for other animals are toxic or even fatal for rabbits. 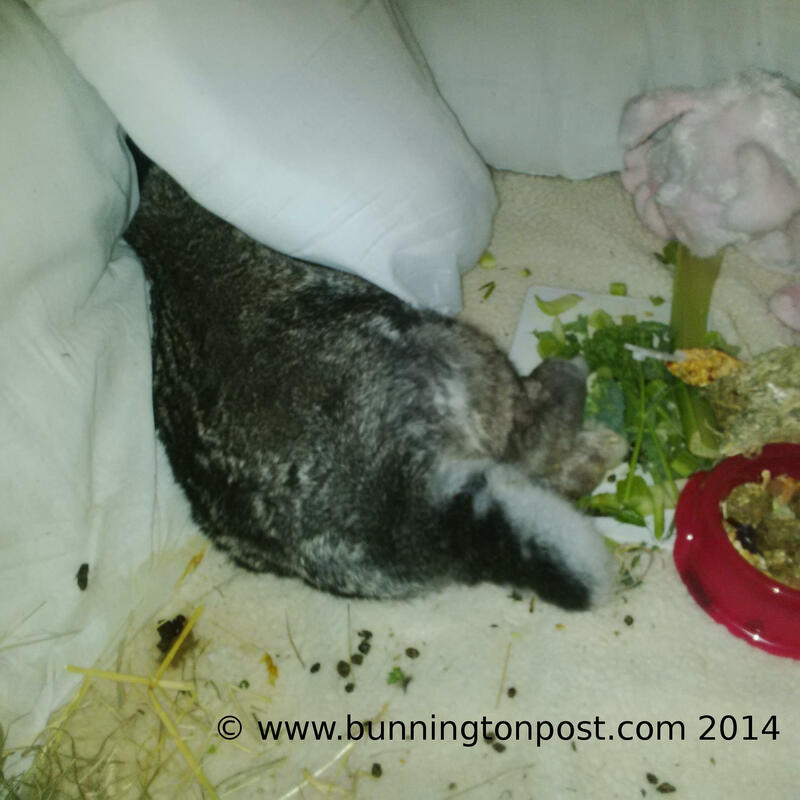 Because Ballo is lively, he’s moving, eating and using the toilet (an achievement in itself!) we can be fairly sure he’s not suffering all of the time or maybe even not much at all. Rabbits who are in pain or discomfort withdraw, they hunch up and are not very responsive, and they don’t do the things they normally do, or much less of them. They might sit with eyes half closed and grind their teeth and when you touch them, their backs, shoulders and flanks feel tense as opposed to soft and relaxed. You know your bunny best, so you’ll be able to spot if and when Ballo is showing such signs of suffering. I remember our vet talking about Bink (the little brown bunny from the beginning of this post) possibly feeling woozy and disoriented because of the EC. He didn’t mention motion sickness meds then though this was some years ago and things are very likely to have moved on since. One tip he did have was to have a small light like a bike light on for Bink at night, so that when he rolled in the dark, he’d have something to tell him which side was up. We attached a tiny red bike light to his hutch and switched it on at night. Whether it helped we don’t know, but it’s one of those things that won’t make things worse. We made sure he had a nice dark corner where he couldn’t see the light if he wanted, because at times he seemed sensitive to light. So have a chat with your vet about the motion sickness med to check whether it’s safe for Ballo and if it is one of those things that won’t make him worse, you could decide to try it. If you do, come and share your experiences with us, who knows, it might be a great help to somebunny else too! Nothing is really normal… Bink did the same. He was eating, interacting with his companion, responded to cuddles and he would sit very happily being groomed by the much bigger Delores and later be rolling non-stop. If you feel Ballo is happy enough, and he can do many things like groom himself, eat, get around, play etc does it matter if he has bouts of rolling? Here is a tool to help you assess his quality of life. If you don’t want to make a decision yet you can use this tool to track over time if and how he seems to change, and if you think his quality of life is where you want it to be. Treatment for EC can take a while to take effect so that’s something to bear in mind. Good luck and many affectionate nosebumps from Bouffe! Of course, no problem Gabrianna! Well, I am no vet, but here is what I know: EC is a parasite that can cause neurological damage (most buns are EC positive but never get sick) and when the parasite isn’t stopped, this damage can get worse. So his symptoms worsening could indicate the treatment hasn’t stopped parasite (yet). Always take Ballo back to the vet if you are worried, even if you’ve just been. Your vet may have another treatment available, but it’s also possible that they have to tell you he is suffering or that his prognosis is bleak. In that case it’s incredibly tough but if you agree with such an assessment you would not want to prolong his suffering, am I right? It is the hardest decision, but it’s part of truly loving and looking after your bunny too. Our pets depend on us, we must do right by them. 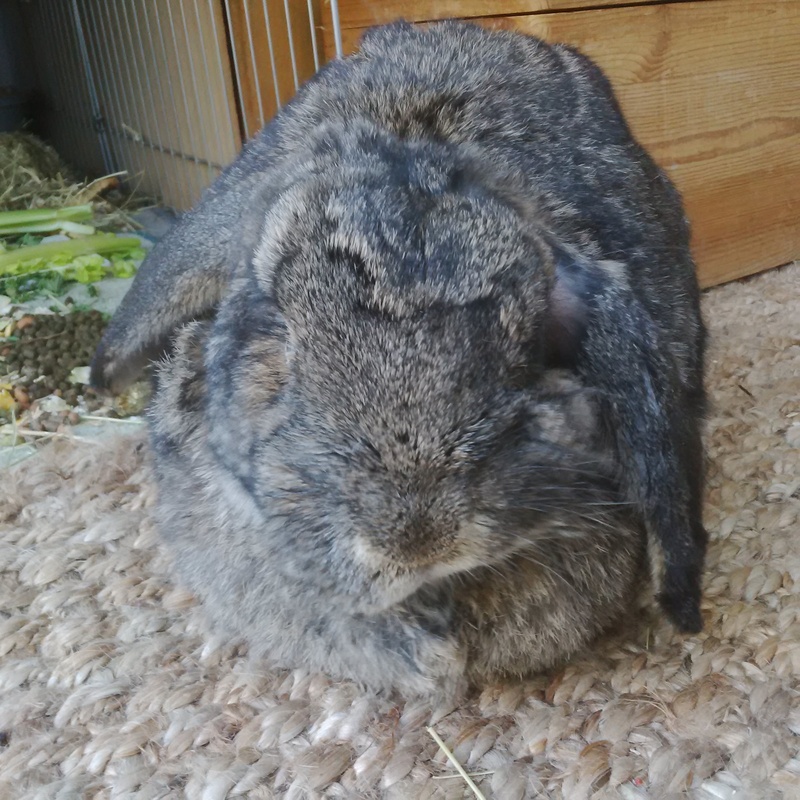 We are keeping everything crossed for Ballo, and hope he will be one of those miracle buns we hear about – many snorgles from us all here at the Bunnington Post! Of course it’s difficult to understand. It is incredibly important Ballo is eating, that is key to his wellness. It also signals that he is interested in food and for that he needs to feel well enough. Bouffe needed two whole weeks of falling and rolling before he became less scared and started to develop techniques to get up after rolling, and not roll so much. A very important difference is that his tilt is not caused by EC, therefore his adjustment is different. You can make Ball’s surroundings safe for him to roll and not hurt himself, it will help with his confidence. Bouffe had his own corner which we made bigger as he started moving more, cushions and rolled up fleeces helped him to get up after rolling or stop the roll from landing him on his back. The Special Bunny website has great tips (see link in the post). Follow your heart with Ballo. The quality of life scale can really help you understand how well he is by looking at different things and weighing everything up. If he has a lot going for him, you can be more confident you are doing the right thing for him. hi Gabrianna again. so i took Ballo to another vet and he’s on two different meds on top of what he’s finishing off from the other vet. i got him also doing the dizzy medicine that i mentioned. it’s called Meclizine. he takes a half a crushed up pill every 24 hours. it’s suppose to help with his rolling. he’s finishing out the meds for the E.ciniculi but since the head tilt got worse they wanna treat him for a possible ear infection. they said if that’s what’s causing the head tilt he should improve within the next two weeks. paws crossed! but i did want to tell you and if other people’s buns are having trouble with rolling and dizziness. i’ll keep you updated to let you know if it helps. i’m not giving up on him yet! So glad to hear you went to get a second opinion. Ear infections are a common cause for head tilt. Bouffe did indeed improve in two weeks and got to the level he is still at three years later: a little wobbly at times but fully mobile. Fingers crossed! Thanks for sharing the dizzy med here too, we’ll look forward to hearing about your experiences with it. Hello. Thank you for such a helpful and informative article. My male chocolate mini lop, Buckle, is being treated for an inner ear infection after developing head tilt. He still interacts with our other bunny (they are such great companions, I even thought of having a rabbit wedding! ), he hops around the garden (his head tilt is less pronounced when he’s outdoors), he’s drinking, eating pellets and nibbling grass, doing droppings and washing/grooming himself. 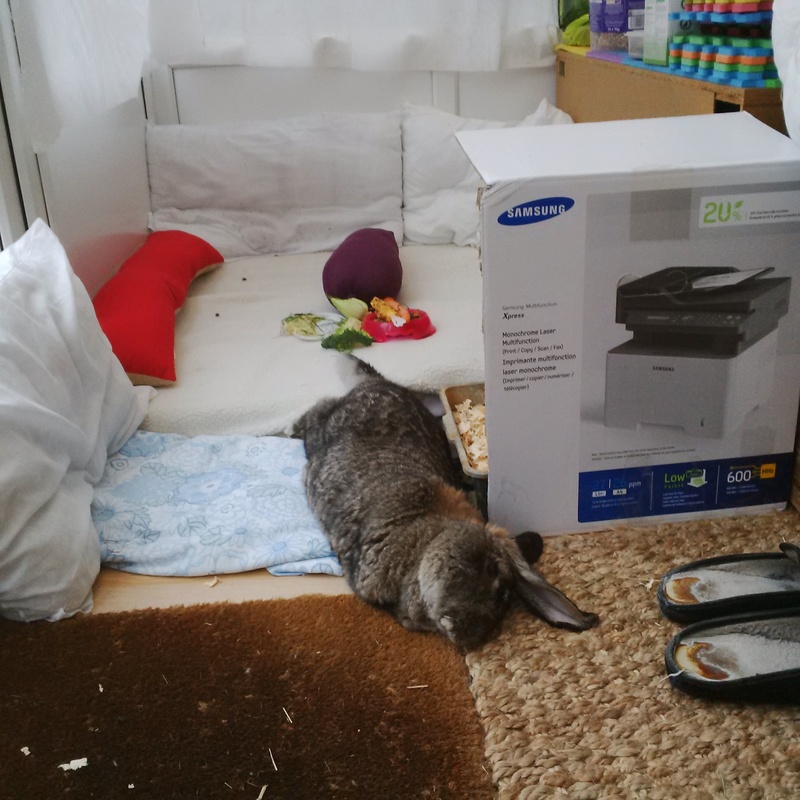 However, he seems to be losing movement in his back legs – he can still move pretty fast when he wants to, albeit sort of sideways, but he can no longer jump/hop up and down steps and ledges and because of this, cannot access his hutch independently. I just wondered if anyone else has had this problem and if so, is it likely to improve or worsen? Buckle sounds like a fun bun! Good to hear he does well and his marriage is unaffected – very important things that will help him a great deal. You don’t say how he is being treated, but you can ask your vet about any known side effects of his meds. If you have a rabbit-savvy vet they may know more. My other thought is to have Buckle tested for e.Cuniculi which is known to be a cause of headtilt and other problems, including neurological ones that may affect mobility (remember, I am not a vet!). It may be advisable to treat him and his companion for EC as a precaution, because he may be more susceptible to it if he is EC positive. Some 60% of rabbits are, with many never having any health issues. Bouffe has mobility issues too and can’t jump on things anymore either, he used to get on chairs and tables several feet up without any issues. It’s down to balance more than anything – can this be a factor too in Buckle, or is it clear his hind legs are less strong? What I’d recommend is seeing what small adaptations you can make for him so he can get into his hutch himself – perhaps a ramp or some shallow steps can help him navigate the obstacle. Good luck and do visit sometime to let us know how Buckle is doing! How distressing to hear that… Of course that’s going to upset you! My take on this is that you know Buckle better than anyone and will be able to see the differences in his behaviour and habits much more than any vet. You’re describing a rabbit who is doing rabbity things as always – hopping around, eating, grooming, showing an interest in his companion. How different is he in your view? Do you think he’s enjoying life despite his health challenges? 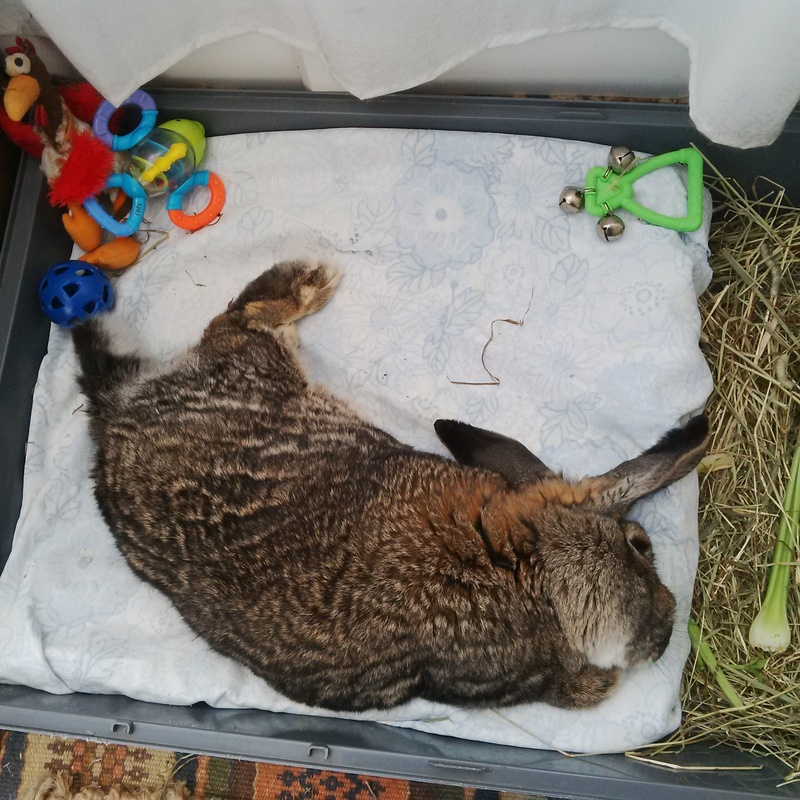 Some vets are a little quick giving up we think; we promptly changed ours when he suggested our lethargic bun was old – she was 5 and simply had a bladder infection which cleared up completely in a week. That’s not the same, but it does show not all vets ‘get’ rabbits in the same way other vets do. One thing I would say about rabbits: a rabbit that is truly suffering does not eat. If Buckle is eating and active, he may experience discomfort instead of pain. 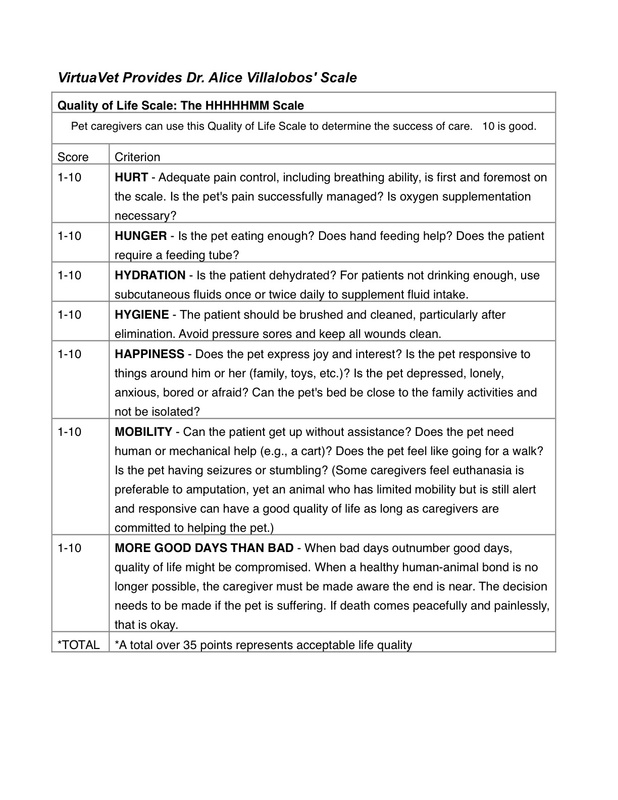 Now for some practical help: do have a look at this Quality of Life Scale which will show if and when you need to help Buckle one last time. You work through the questions and tally everything up, and decide where for you the cut-off lies for Buckle (the tool suggests something you can choose to disagree with). It might be more helpful than just going on your vet’s suggestion alone. Sending you many snorgles from everybun, we’re rooting for you all! What a lovely message – Bouffe is very glad his story has helped cousin Pumba. How good to hear the vet says he’s improving too! I am sure that has a lot to do with everything you are doing for him. We’re very glad our story gave you some inspiration and confidence in Pumba’s future. He’s now just a little bit more special than he already was! We wish you many more happy years together. Very sorry to hear about Honey! It is very upsetting and worrisome to see a beloved bun in such distress. I would recommend taking her in to see the vet again since she is worse than at first. Have the vet look at her ear, if she is shaking her head it could be an indication there is a problem there. Bouffe receives weekly penicillin injections for his ear infection and they make a difference, do ask the vet what they think. When we are late with the injection he becomes wobbly on his feet, so it’s something he needs to be on. It has been nearly three years now. Honey is a very young bunny so worth fighting for! Bouffe was about 7 years old when this happened, he’s now an oldtimer and he has a very nice life complete with a headtilt. Have a read on the Special Bunny website (the link is in this post) for tips on how to make Honey comfortable. Bouffe improved enough to be left alone for several hours after a few days. He spent much of his time sleeping! I find the scale very useful because it also looks at things I overlook when I am upset. I hope Honey improves! If she does retain a tilt, please remember if bunny is comfortable and otherwise healthy, she’s just going to get on with rabbity things with her head sideways! Good luck and many snorgles from us all – we’ll be thinking of you! Thank you for sharing Squidje’s difficult story. What a great vet you have helping you look after him! You’re obviously putting everything into helping him get a good life back and that is really wonderful. Remember, I am not a vet but merely a fellow bunny waitress who has been at the beck and call of a few interesting rabbits over the years, so please take any advice I have to impart in that spirit. Is Squidje able to groom himself in the affected area? If so, it’s important not to use anything that would be harmful if ingested. We use a lot of baby products with our rabbits, as they are usually very gentle. On irritated skin we sometimes use Sudocrem, which is used for nappy rash, and this soothes immediately. If Squidje can get to it, put it on very lightly and reapply a few times so minimise ingesting it. If you can’t get Sudocrem where you are, have a look online or ask a pharmacist what they recommend that is similar. Everybun sends affectionate nosebumps and well wishes for Squidje, and I hope he will improve soon with your help. Please visit again to tell us how he he doing, we will all be rooting for him! How sad to hear about Harry’s infection and head tilt. It is great that you have brought him indoors with his companion – he needs Louis and Louis would pine for Harry if they were separated. An ear infection can cause a head tilt and so can e.cuniculi. It is the latter that can also cause blindness by causing cataracts, which is not the same as the ulcers you describe. You can ask your vet to treat Harry and Louis for e.cuniculi as a precaution – if the tilt is caused by the parasite, Harry is losing precious time. You can assume that Louis will be positive for it too. According to Bouffe’s vet who treated Bouffe for his ear infection both can be treated at the same time, so do ask. In fact, quite a few people treat perfectly healthy rabbits at frequent intervals for e.cuniculi as a preventative measure, so it is not a strange question at all to ask. To my knowledge (remember, I am not a vet!) a head tilt does not cause blindness. The eyes do become more vulnerable to problems though, so Bouffe gets some extra care for his, mainly grooming and drops every so often if the eyes look irritated or weep. I hope this helps… We are all sending snorgles and will be cheering you and Harry on for a good recovery. We hope you’ll come back to tell us how it’s going. PS 5 is not old, Harry has at least another 5 in him with such a loving waitress! Don’t let anybody tell you that ‘five is a good old age’ for him, he’s only getting going. Head tilt or not! Just doing research on our bunny and his condition, and trying to make the right decision. He is 7 years and 10 months. We have been diagnosed with both Pasteurella, and E. Cuniculi, and have been doing Panacur, Baytril, Metacam, Mataclopromide and some Chinese medicine. It’s been 3 months. 3.5 months of syringe feeding (Critical care), very little veggies (diarrhea if more than 1 parsley, no sugars), Alfa Alfa and Timothy hay (very little interest) and almost no interest in pellet food. We cannot walk at all, we have a sore on 1 hock we completely avoid, though it’s healed up pretty nicely. Quality of life: Not improving. Giving him till next week to see if there is any improvement. Very sad and heartbreaking, we might not be ones to make it. But we had a great life! What a sad story. 3,5 months of syringe feeding will surely be taking its toll on him. It’s sometimes pretty hard to look after bunny well and that’s when they’re well; deciding when you need to help them one last time is the hardest one of all. Wishing you wisdom and sending bunny gentle nosebumps in these tough times. I did find this now, few months later. but it just assures me we have made the right decision. On July 16th, 2016 Bunsters got his wings. We miss him dearly, but the last week prior to his last appointment, he got much worse. Soiling himself, had to be bathed once to twice a day, not moving, barely eating, no appetite, couldn’t even move a step like he did a few weeks back. Just laid there all crooked. He weighed 3.1lbs (5.5 – 6 lbs when healthy). His doctor said he would have to get back on antibiotic injections, and we decided not to put him through any more discomfort and pain. And the look in his eyes became a little more empty every day. He would score very low according to that chart. I must say, that once the doctor gave him strong sedatives, he relaxed, and for a few moments felt better, almost could his old self again and enjoyed some parsley, until he was too tired to eat. I will never forget that day, but I will also keep him in my heart forever. Ah, dear Bunsters, what a wonderful bun. And such beautiful memories too cherish! The things our rabbits teach us are amazing, and we should take them with us in everything we do. Bunsters forever! It’s almost 1am during my first night with head tilt that I thought was a broken neck at 7am, now the previous morning. Didn’t care for the vet that I took Aspen to. He only gave me six days of antibiotics – Enroflaxacin – even though he really couldn’t see anything wrong with the ears, and no pain meds. Through research I just tried half an 81mg aspirin with water. Poor Aspen has been flipping around all night and it really concerns me how much he is hurting himself. Aspen appears to have paralysis except for when he starts to flip around. Are these seizures? I know it has not been long, but is he really suffering too much? I’m unsure about taking him to a more rabbit-specialized vet. I don’t have the available funds to invest in long-term treatment and with a 40-hour job, my care time would be limited. I don’t know what to do for him. Poor Aspen! And we all also feel for you, having to deal with his suffering and deciding what to do. First of all I’d say do take him to a more rabbit-oriented vet, perhaps ring a few practices in your area first to ask, and Googling also helps. If you do find what causes it, you will know more about his quality of life than you do now and what he will need to obtain it. It will give you peace of mind that you did the right thing for him. Second, the flipping in Bouffe’s case lessened considerably after about 24 hours, when he started to adjust. He was pretty limp in between these bouts, probably from exhaustion. If you can spend as much time with him in these hours, and prop him up in a fairly snug bed to help him get is bearings (the world is upside down and inside out for him right now), he is likely to calm down. He will still do it but mostly when he moves first. For Bouffe these flips were almost gone after 2 weeks. I am not sure if Aspen’s flipping is caused by seizures, but of course I am not there with you to see it and I am also not a vet! I do remember how Bink was when he had seizures, and they were nothing like Bouffe’s flipping and thrashing. What you describe about Aspen sounds a lot more like what Bouffe did: a constant violent thrashing about, very noisy and awful to see. Bink’s seizures had him rolling over on his back fairly slowly if suddenly, he would lie there and shudder, legs twitching, and he would go stiff. He recoiled if you touched him then (Bouffe calmed and relaxed a little when we did that), and the seizure would pass after some minutes. If I saw him have one he’d just continue lying on his back until he had his strength to right himself – or let me gently help him up. A little while later he’d be bumbling about as ‘normal’ (bad balance so a lot of falling over). Third, long-term treatment is not necessarily going to be expensive and/or complicated. 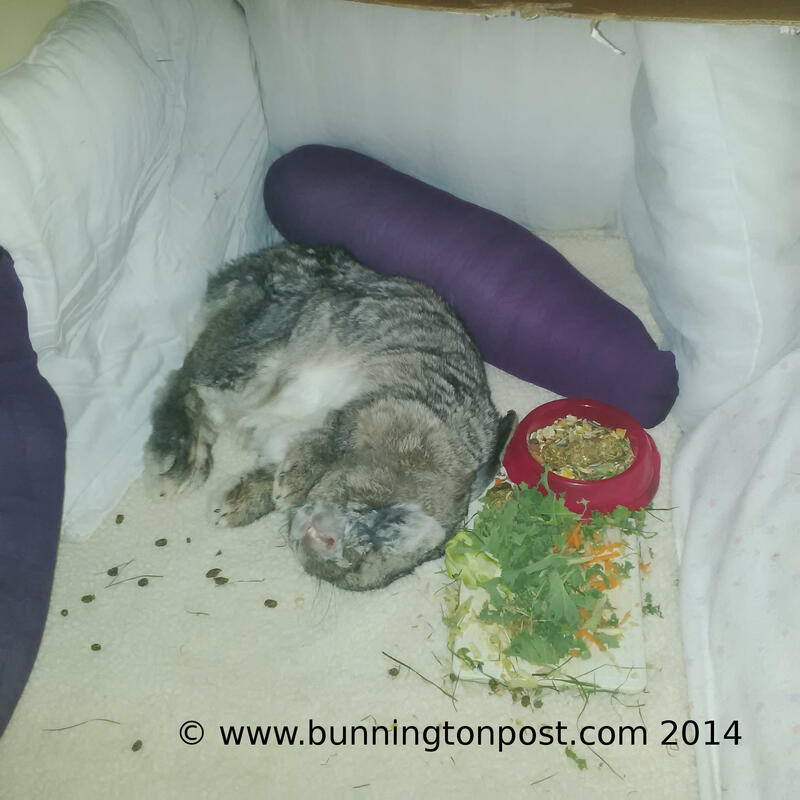 Bouffe needed his meds for some weeks – pain meds, EC meds that were just in case. The injections that he still gets are a few £/$ a syringe and he needs about 4 a month. He goes to the vet just once every quarter for a ‘hey mate howya doin” visit. Just ask your vet; it may be a case of a number of weeks that Aspen needs real medical attention and this depends on what’s causing it. A tip: keep the meds you don’t use, such as leftover Baytril and Rymadyl tablets. They keep for years and years. Keep the label on so you remember the dosage and frequency. Google them if you’re not certain exactly what they had been prescribed for. A little stash like that can come in more than handy in emergencies. Finally this: rabbits are hugely resilient, and when they pick up a disability like a tilt, a lot of them simply adjust to the new normal and continue to be just as loving and fun as before. So if your vet says Aspen has a great chance to adjust, you need to decide whether you can help him through the first weeks. That’s not easy with a full-time job that takes you away from the house all day but again I’d say rabbits are very resilient and if you give him a set-up that is safe to be in you know you’re doing everything that is within your reach for him. Good luck, please come by again to tell us about Aspen, we are all rooting for him (and you)! PS one more thing came to mind: sometimes an ear infection cannot be seen by the vet by looking in the ears, because the infection is in the inner or middle ear. Bouffe’s ears looked exemplary too until he was operated on one of them. So at least you have antibiotics, but hopefully a better vet will look further and come up with a more comprehensive treatment plan for Aspen which includes treating for an unseen ear infection. My 4 month old bunny Meredith (yes, named after Meredith Grey haha), started showing symptoms of head tilt 7 days ago. She only had a very slight head tilt and I didn’t even notice it until the vet pointed it out. What I did notice though was that she was falling over and having problems balancing when she went up on her hind legs. the vet at the 24 hour animal clinic prescribed her Baytrill, decided it was probably pasteurella, and sent us home after a brief exam. 4 days later I woke up one morning and her head was completely sideways and her “bottom” eye was swollen shut and gunky and pink when i checked it out. a couple hours later I witnessed her first rolling episode. I decided to take her to a different clinic this time where the vet did a more thorough exam. She found yellow pus in both ears which 4 days earlier, the first vet had described as “pretty bunny ears” while looking in them. She examined her eye with a grim face and announced that she had a bruise on her face as well from hitting it on things, and that her eye was damaged from smashing it on something, as well as infected. After a long discussion on my many options I decided to take Meredith home. The vet prescribed me a stronger antibiotic, an antiparisetic, and some voltaren drops for her bad eye. She also took her to the back and gave her an injection of an anti-inflammatory to calm the nerves in her inner ear. I’ve been treating Meredith from home in her pillow fortress for two days now but have not noticed any improvements or decline in her condition. She has never had a problem with eating, drinking or pooping and she is still very mobile and perky. The only times she really rolls are when I pick her up and put her down after giving her the medication and eye drops. This seems to be the most disorienting for her. She seems to be a little trooper and is still pooping in her litter box and eating all her fruits and veggies. What I am wondering is if there are any head/neck braces available to help her hold her head straight, and what your thoughts are on the situation in general? thanks for sharing Meredith’s story. It is very upsetting to see your rabbit so afflicted, isn’t it? What a missed chance when you went to see the emergency vet, thankfully your regular one seems much more on the ball now. To me it sounds like the vet is covering all bases – Meredith has several things going on at the same time. The key thing is that bunny is perky, eating, dropping raisins and moves about. A rabbit withdraws when it is not well, and Meredith is doing the opposite. That’s really encouraging and she must be comfortable enough to do all those things, so take your clues from changes in her behaviour. Now for your question, I don’t know of any braces, but that doesn’t mean anything. They could well exist! I never thought of looking for them, to be honest. Why not search the net to see if those braces exist, and how to make or obtain one? Daily massages really help, and sitting with bunny and holding the head gently up if the bunny allows, for example while having a cuddle session. We tried a so-called Bunny Hugger from a shop called The Hare Apparent on Etsy, which helps bunny to rest with their head supported. Bouffe didn’t like it, so we gave it away. He prefers to lie between feet for support! Different bunnies go for different things, so just see what Meredith likes and dislikes – you’ll find out soon enough. As I write this Bouffe is romping around the garden in the pitch dark as he likes his late evening walkies before bed. His tilt doesn’t stop him from anything except jumping on the furniture! So, if Meredith rejects the support you find for her, all is not lost. Bouffe is one of many, many bunnies running around perfectly happily with a tilt, and she is showing early signs she might join those ranks. One thing I would discourage you from doing is picking her up unless you absolutely must, even if she was previously quite used to it. With Bouffe this leads to disorientation and rolling (which otherwise he rarely does nowadays) and this lasts for a few hours. She will also be busy ‘mapping’ everything around her so she can navigate around with a tilt, so picking her up and moving her could be confusing too. We all send you healing thoughts and affectionate nosebumps and are cheering Meredith on as she adjusts… Do come back again to let us know how she is doing, we’d love to know! Poor Newman! Has your vet tested him for e.Cuniculi? He might respond to treatment if he is found positive (the bun, not the vet), it is a bit hit-and-miss but there are good examples of of rabbits who acquired the tilt because of e.Cuniculi and made a sometimes full recovery after being treated. The other cause I know of is ear infection, so it is worth taking Newman back to the vet to check he is not having any problems with his ears. All the best, and pop by sometime to tell us how he is doing! That’s wonderful news! So glad to hear that he’s adjusting and improving. It’s great he’s getting more mobile, and hopefully this means his action radius is going to grow bigger and bigger. Well done little bun, and well done to you helping him back on his feet! We have a Newfoundland dwarf bunny that we had for a short while when her head tilted. Took her to be vet and got antibiotics. Ear infection cleared up and she has continued to eat and drink and play normally and is very social with us. We asked about her suffering with the tilted head and the vet said she wasn’, that sometimes it straightens and sometimes doesn’t. So we have had Lucy 4-5 years with a tilted head. People think “poor bunny” and she does look weird but we love her. Last week her head straightened. Just out of the blue. It’s crazy. We are very happy though. Wow, what a heartening story! Clever Lucy, it’s wonderful to hear that even after such a long time tilts can literally right themselves. We completely agree with you that it may look weird but it makes no difference when it comes to loving the bunny! Perhaps a little more so because they are even more special than a ‘regular’ bun. Lucy’s story just goes to show rabbits are incredibly resilient animals and that they really deserve all the chances we can give them to have a happy and healthy life. How terrible for the little fella! For such a young little rabbit to suffer headtilt is really awful. It is good that he is on Panacur and Baytril as they will help him a great deal if the tilt is caused by e.Cuniculi, which your vet is probably suspecting. He’s also going to benefit from lots of physical contact, such as gently supporting his head while softly massaging his neck and shoulders, as he’ll undoubtedly have sore muscles and cramps. Some people with EC bunnies report that this helps to correct the tilt over time. And a good long cuddle is always wonderful, especially with such a little one who is still getting used to his new home. Thank you, I’m glad to hear the article is useful. Rabbits are very resilient creatures, they can adapt to many changes. Bouffe will always have a tilt now, but it doesn’t seem to limit him much anymore-we still have to hide or shoes out risk having them bunstructed! This is an extremely helpful and inspirational post! Keep improving, Bouffe!